Exclusive! Flutter and flair! Nothing could be more graceful than this shimmering draped Draped Chiffon Overlay Top. 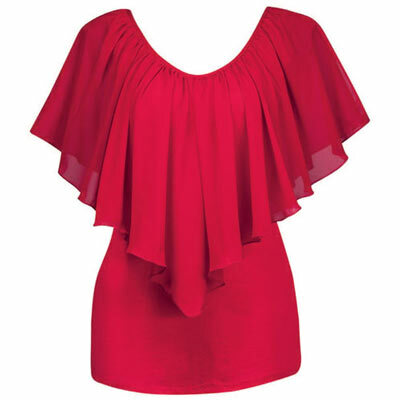 Softly gathered neckline with sheer ruffled sleeves are slit at the shoulder for more movement. Attached tank top underneath for coverage. Polyester/spandex and polyester chiffon. Machine wash. Imported. Misses, approx. 25"l.